As a part of the renovation of the kitchen at our home at Creek View I made the decision to migrate to a single oven and add the Wolf Steam Oven Model CS030/CM/B/TH as a part of my appliance package. 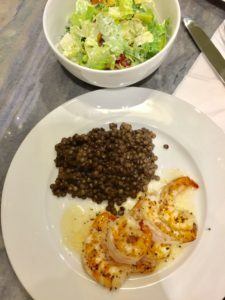 I began using my new kitchen in mid-October after living in our guest quarters and cooking with a microwave and as weather permitted our Weber grill from February to October. I have been experimenting with the steam oven capabilities. I will continue to add finding as I discover new uses for the features. First let me start by saying we have 9 hens and a rooster here at Creek View, so when production is in full swig we product about 5 dozen eggs per week, so I am always looking for new use of the eggs. Egg Salad; one of our favorites. Steaming eggs in the Steam Oven is a breeze. Simply load up the oven with the number of eggs you would like to hard boil, hit the Steam button and set the timer for 19-minutes. When the time signal your done plug them in to a bowl of ice water! Anyone who has ever had chicken, know how difficult it can be to peel fresh eggs; not the case when boiled using the stem oven, when cooled about 10-minutes the shell almost com off in one piece. Note: To salt or not to salt prior to cooking? 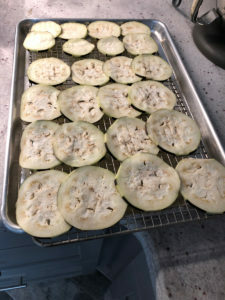 Sprinkling salt over eggplant slices before cooking them draws out the vegetable’s moisture. It’s a process known as “degorging”. 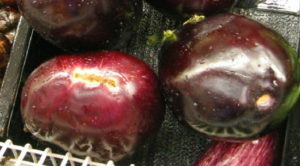 Larger, older eggplants have brown seeds that contain a bitter liquid. Salting eggplants removes some of this liquid and improves their flavor. In general, it’s not necessary to salt smaller eggplants since they have fewer seeds than larger eggplants. I like the taste of eggplant and prefer to fry the eggplant lightly for that reason. 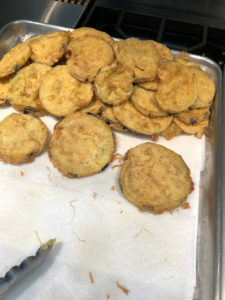 I do not use breadcrumbs, I simply dip in season flour and then egg wash; eggs beaten with a little water and then fry. I salted the eggplant for this version because there were some brown seeds. 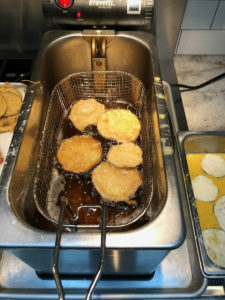 I like to fry my eggplant is a fryer, (375-degrees) it takes a bit longer, however, it uses less oil because the temperature is easier to control, however it you do not have an electric fryer it can be done in a pot with a frying thermometer or simply in a sauce pan. Assembly is easy, a bit of sauce in the bottom of a pan, a later of eggplant slightly overlapping, with a layer of mozzarella cheese and your favorite marinara sauce. I suggest that you do not use pre-shredded cheese. It’s a tempting shortcut: spend a few more dollars for a bag of shredded cheese and save time—and potentially skinned knuckles—by not having to grate the cheese yourself. I usually prefer to shred my own mozzarella for pizza, pasta bakes, etc., since most pre-shredded cheese contains anti-caking agents like cellulose powder (miniscule pieces of plant fiber) that can make the cheese stiff and dry. Bake at 350-degrees for about 30 minutes, I like to make a day ahead and re-heat because I thing the flavor meld better. Well I’m back, I have been busy moving, renovating our Rivah house and traveling. 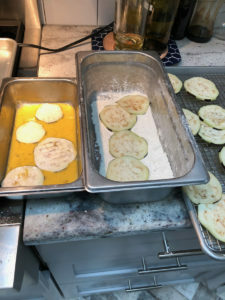 We spent a about a month in Cambodia and Vietnam so I wanted to post a few recipes for my readers. While there I took a cooking class and a street market tour to familiarize myself with the local ingredients. You can find more about some of the local fruits at this post on our travel blog. For the onion mixture: Heat oil in oven over medium-high heat until shimmering. Cook onions until golden, 10 to 15 minutes. Add garlic, oregano, and pepper flakes and cook until fragrant, about 30 seconds. For the marinara: Add tomato paste to onion mixture in pot and cook until fragrant, about 1 minute. Add wine and cook until slightly thickened, about 2 minutes. Stir in water and tomatoes and simmer over low heat until sauce is no longer watery, 45 to 60 minutes. Stir in cheese and basil and adjust seasonings with salt and sugar. Simmer lentils in a saucepan covered until all of the liquid is absorbed into the lentils. This should take between 15-20 minutes, about ½ way through add the curry. Just before serving add salt to taste, in this recipe I used Himalayan pink salt. Cook for 20-minutes and cool. Marinate duck breasts for 24-hours. Pat the duck breasts dry and add to hot pan and sauté. Slice fot tacos. Serve with pickled red onions, cilantro, kimchee and tomatillo sauce (Salsa verde). Tomatillo salsa verde, a delicious Mexican green salsa made with roasted tomatillos, chile peppers, lime juice, cilantro, and onion. I like to include a few garlic cloves in with the oven roasting method. 2 Oven Roasting Method Cut the tomatillos in half and place cut side down on a foil-lined baking sheet. Place under a broiler for about 5-7 minutes to lightly blacken the skin. 3 Place tomatillos, lime juice, onions, cilantro, chili peppers, sugar (if using) in a blender or food processor and pulse until all ingredients are finely chopped and mixed. Season to taste with salt. Cool in refrigerator. Preheat oven to 350 degrees and grease 4 large Muffin Cups. In a large mixing bowl, stir the cornmeal, flour, sugar, baking powder, and salt. Pour in the vegetable oil, melted butter, honey, beaten eggs, and milk, and stir just until moistened. 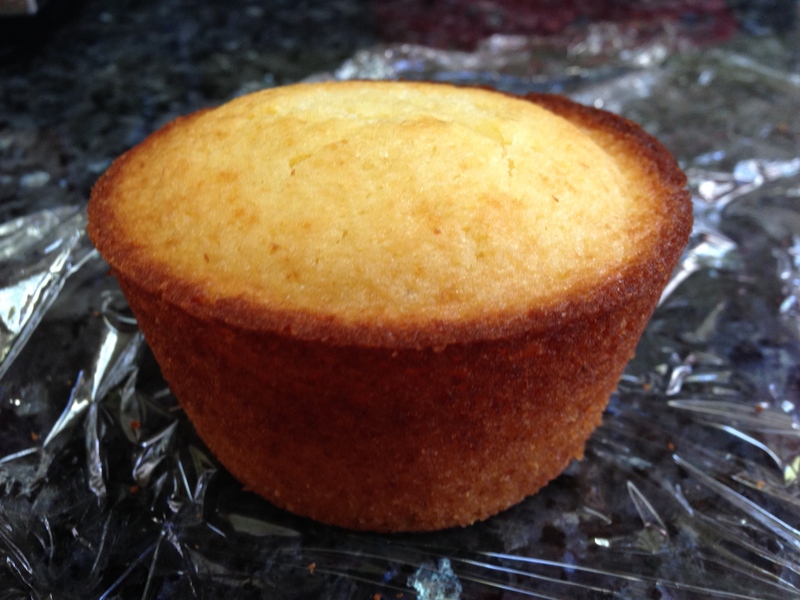 Pour the batter into the greased baking muffin cups and bake in 350 degree oven for about 25 minutes. 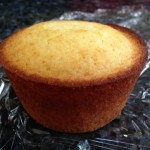 Watch the cornbread towards the end, you want it to be turning golden and starting to show some cracks. Remove from oven, serve warm with butter or honey or simply plain. It’s amazing! 1. 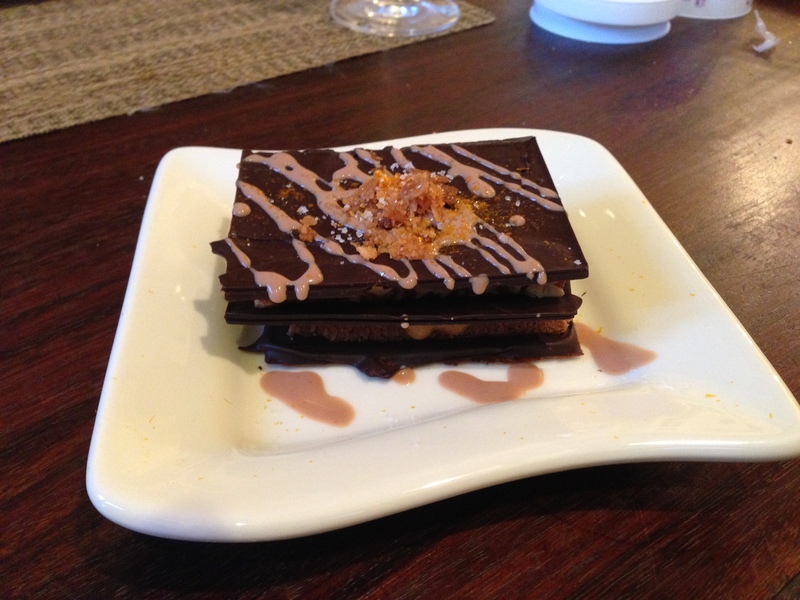 Place 1 chocolate plaquette onto each plate and top with 1 milk chocolate biscuit. 2. Top biscuit with a second plaquette, add a smear of praline cream and 1 rectangle praline feuilletine and another smear of praline cream. 3. Pipe 2 lines milk chocolate cream onto feuilletine, and top with 1 final chocolate plaquette. 4. Sauce plate with chocolate sauce and praline cream. Sprinkle with scant grains of sea salt, and editable gold and serve. Melt 3/4lb – 1 lb of dark chocolate in a double boiler and then spread into a mould. I made a mould by purchasing 4 silicon sheet, 1.2 mm thick, and the cutting the rectangles 2 ½-inches by 3 ½-inches though 3 of the layers and stacking them. I let the chocolate set up for about 30-minutes and the removed the silicon mould and plated in refrigerator for about 30-minutes to harden and transfer to a air-proof container. Sift together flour and 4 tablespoons sugar. Reserve. In a medium-sized mixing bowl, thoroughly incorporate butter into melted chocolate. Stir in egg yolks and invert sugar. Reserve. In a separate bowl, whip egg whites to soft peaks, adding remaining sugar. Fold in sifted cake flour, then milk chocolate base. Transfer batter to a parchment-lined half sheet pan, spreading into a thin, even layer. Bake in a convection oven preheated to 325 degrees F 10 to 12 minutes. Cool in refrigerator, then cut into 1-inch by 3-inch rectangles. Reserve, refrigerated. 1. In a large bowl, combine melted chocolate and praline paste. Stir in feuilletine until completely combined. Roll to 1/4-inch thickness between 2 pieces of parchment and reserve, chilled. 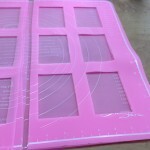 Cut into 1-inch by 3-inch rectangles. Reserve. 1. In a small saucepan, bring cream to a boil over high heat. Place chocolate in a bowl and slowly incorporate hot cream in to chocolate, stirring until smooth. Cover and reserve, refrigerated, several hours. Transfer to bowl of an electric stand mixer and whip until stiff. Transfer to pastry bag fitted with large, straight tip. Reserve. 1. Combine sugar and glucose in a heavy, non-reactive saucepan and cook to medium dark caramel. Remove sugar from heat and deglaze pan with a portion of warm cream. Add remaining cream and cook until caramelized sugar has dissolved and mixture is homogenous. In a separate large bowl, combine chocolate and peanuts. Pour hot caramel into chocolate mixture, stirring to combine until chocolate melts and is thoroughly incorporated. 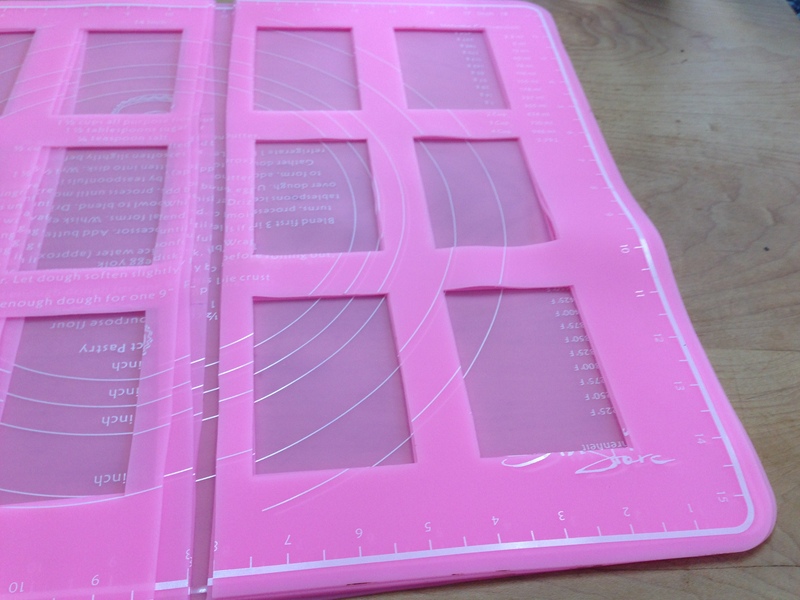 Pour onto silicone baking mat-lined frame or other form; reserve to set at room temperature. Reserve. 1. In a small saucepan, heat cream just until warm. Place praline paste in the bowl of an electric standing mixer fitted with paddle attachment, then slowly incorporate cream, mixing until completely emulsified. Reserve. Mix the ingredients, spread very thinly on a parchment or silicone mat lined baking sheet, and bake at 400 F until golden brown, about 5 minutes. If you are going to roll or mold them, do so when they are still very hot. You could then crush it for . If you are going to do crush them, there probably is little point in rolling or molding them. People tasting praline paste for the first time tend to fall to their knees and weep for all the wasted years. For while it is an ingredient, it’s also a spread in its own right, a sweet nut butter with strong caramel overtones. You’ll need to resist the urge to keep spooning it into your mouth until it’s gone. The formula is elementary: 1-1 sugar to nuts by weight, but most people like to divide the proportion of nuts between blanched almonds and hazelnuts. So let’s say, for purposes of argument, you wanted to make a pound of praline paste for a mid-day snack. Place the nuts on a sheet of lightly greased parchment paper or a silpat. Then simply add the water to the sugar in a small saucepan and heat it over high heat, swirling until the mixture turns to caramel. Dark amber is usually the degree most pastry makers cook to, though you can go darker for a stronger flavor. Pour the caramel over the nuts and allow the mixture to cool completely. Then break the praline into pieces and grind them as finely as you can in a food processor until a paste forms. It won’t be as smooth as commercially-made praline paste, but the flavor will be, well…you’ve got to try this stuff to believe it. 1. Combine butter and coconut oil in a standing mixer with a paddle attachment, cream together and then add sugar and cream until light and fluffy. 2. Turn mixer to a lower speed and add eggs, 1 at a time, until fully combined, then add vanilla and salt. 3. Sift together pastry flour and baking powder and set aside. 4. Add coconut flakes to egg mixture and fold in flour mixture just until combined. 5. Pipe batter into individual 2.5-ounce silicon molds coated in cooking spray and bake in a preheated 350-degree F oven until centers spring back and cakes are light golden brown on top, about 16-minutes. Cool before unmolding cakes. 6. 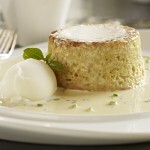 Whisk together condensed milk, evaporated milk and coconut milk and then divide milk sauce in half. 7. Combine half of milk sauce with bloomed basil seeds and jalapeños and set aside. 8. Soak cakes in remaining milk sauce for at least 20 minutes. 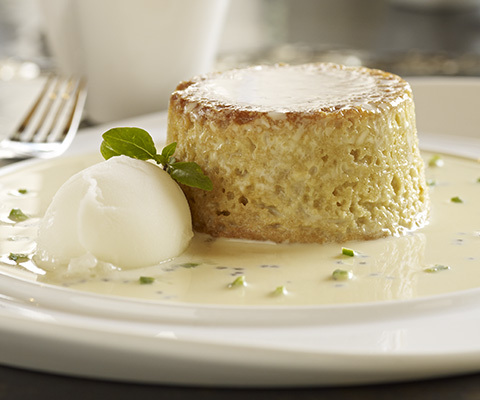 Remove cakes from sauce and serve at room temperature or slightly warm with pineapple sorbet and basil seed-jalapeño sauce. 1. Stretch pizza dough ball to a 13-in diameter circle and then build with mozzarella, basil, mushrooms, jalapeños and finish with sopressata marmalade. 2. Bake pizza for up to 90 seconds in a preheated 900-degree F wood-fired oven. Drizzle with olive oil and serve immediately. 3. Note: Slice mushrooms and jalapeños and sauté separately until tender with butter, garlic and shallots. 1. Combine flour, salt and yeast in a large bowl and whisk until homogenous. Add water and incorporate into flour using hands until no dry flour remains on bottom of bowl. Cover bowl tightly with plastic wrap and allow dough to rise at room temperature for 2 hours. Shape dough into four 10.5-ounce balls and place each ball in a covered, quart-sized deli container. Allow to rise at least 6 more hours and then refrigerate for 12 hours. Remove from refrigerator and allow dough to rest at room temperature for at least 2 hours before stretching and cooking. 1. Spread 3/4 pound of sopressata in a single layer in a large skillet and cook over medium heat, stirring frequently, until browned, about 20 minutes. Transfer to paper towels to drain. Remove fat and clean pan and repeat with remaining sopressata, reserving browned bits and 1 tablespoon fat in pan. Add shallots and garlic to pan and cook over medium heat, stirring, until translucent, about 5 minutes. Add chili powder and mustard and stir for around 1 minute. Increase heat to high, add maple syrup and bring to a boil, scraping up browned bits. Add vinegar and brown sugar and return to a boil. Add reserved sopressata, reduce heat to low and simmer, stirring occasionally, until liquid reduces to a thick glaze, around 10 minutes. Transfer mixture to a food processor and pulse until it has consistency of a chunky jam. Refrigerate in an airtight container up to 4 weeks.